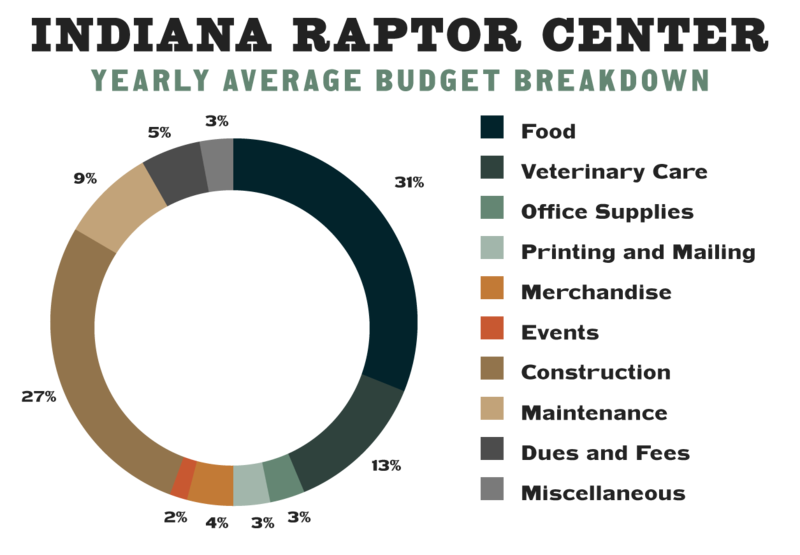 Indiana Raptor Center, Inc. is funded solely by donation. We do not receive funding from the Indiana Department of Natural Resources, the United States Fish and Wildlife Service, or any government agency. Our funds come to us through grant applications, private donations, and fundraising events. Donations may be mailed to the address at the bottom of this page, or sent to us via Paypal. It’s as easy as clicking any of the heart-shaped buttons found on this website. Every donor will receive a letter to use for tax preparation purposes, since we are a 501C(3) organization and all donations to us are tax deductible to the extent allowed by law. Donations go directly to the purposes described below. Our staff is not paid for their efforts. Thank you in advance for helping us to support both our education ambassadors who live at the center, and the patients that come here in need of our help and extended care. Laura Edmunds releases a rehabilitated Bald Eagle as KayLee Witt captures the moment. Moments like these are made possible by our generous donors. While the feeding, care, and housing of birds makes up the bulk of our yearly budget, we also must deal with many expenses that come with keeping the organization up and running. Direct donation is only one way you can support InRC. Please consider supporting us in any of these ways. InRC is deeply grateful for our generous corporate sponsors, who donate goods and services that make our work so much easier. To see our full list of corporate sponsors and find out how your company can help, click here. Indiana Raptor Center is part of the Amazon Smiles program, which is a very easy way to donate. All you have to do is visit the Amazon Smiles website. When you log in to your existing Amazon account, and then choose to support Indiana Raptor Center. then, when you shop through smile.amazon.com, 0.5% of every purchase you will be contributed directly to us! We are always in need of supplies for every aspect of our operations! Purchasing items from our Wish List is a meaningful way to directly help us in our efforts. See the full list. 100% of the proceeds from merchandise in our on-line shop goes to the care of birds. We offer a variety of prints, stationery, stickers, and garments featuring the illustration and photography of Indiana Raptor Center's own David Orr. There's something for every bird lover in your life! © 2014-2016 Indiana Raptor Center, Inc.
Website design and administration by Blue Aster Studio. This site has been typeset in Skolar Web with headlines in Hamilton Slab Columbian, Van Lanen, and Unit Gothic.